Duval learned the news of her diagnosis after her first round win in the qualifying draw at Wimbledon, .tennisworldusa.org reports, but continued to play on, winning 2 more matches in qualifying and one match in the main draw. Vicky Duval stunned the world back in 2013 at the US Open when she beat Tennis champion Samantha Stosur. 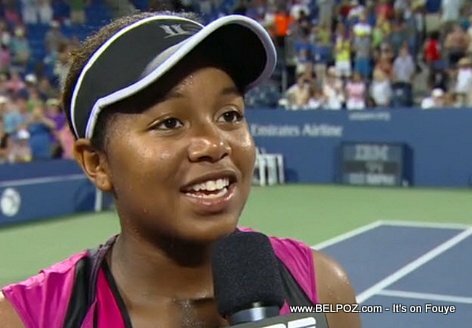 Also read: TENNIS - 17yr Old Haitian Girl Victoria Duval wins BIG at the 2013 US Open! There is a little bit of good news though... According to a statement released by her agent, the cancer was caught in a very early stage and Duval "will undergo treatment right away and due to her overall good health and isolation of the cancer, the prognosis is a full recovery in a few months. Duval learned the news of her diagnosis after her first round win in the qualifying draw at Wimbledon but continued to play on, winning 2 more matches in qualifying and one match in the main draw. As a cancer survivor, I advise her not to panic. God will heal you and make you become stroger. Haiti needs you for Rio Olympic 2016, God just give you a break, Don't forget you are from the strongest nation on earth. All 10 000 000 haitian people are paying for you, we love Vicky. I wish "Vicky" good luck and i hope you pray alot, because there is nothing God can't do.Open your heart to him and he will listen to your prayer. My hearts goes to you. I just went through the same thing with my daughter. Do your research and do not take it lightly.